Add participants to the event. Actual result: the time period switches to the future (in my case, from 2/5 at 9AM to 2/5 at 5pm). This happened more than once. See labeled screenshots below, which document the second time I did this. The time when I did all this was about 11 am. jmatazzoni triaged this task as Normal priority. jmatazzoni moved this task from Untriaged to To be estimated/discussed on the Community-Tech board. 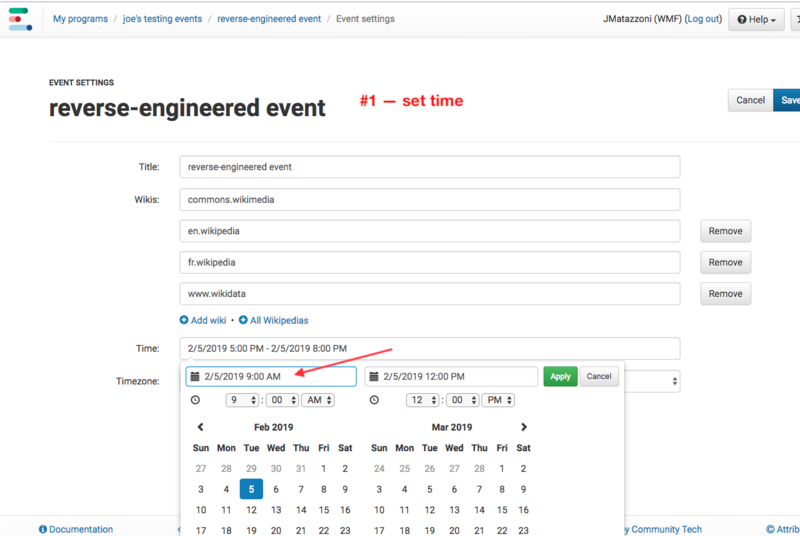 jmatazzoni moved this task from Backlog to To be estimated on the Event Metrics board. Looking at the screenshots, my guess is that timezone conversion isn't happening the way it should. Might just be only a frontend problem. You added time as 9am which shows up as 5pm afterwards. 9am PST is 5pm UTC. I'm pretty sure dates are all stored in UTC in the backend. Yep, I think we're just not passing the right value to the datepicker. 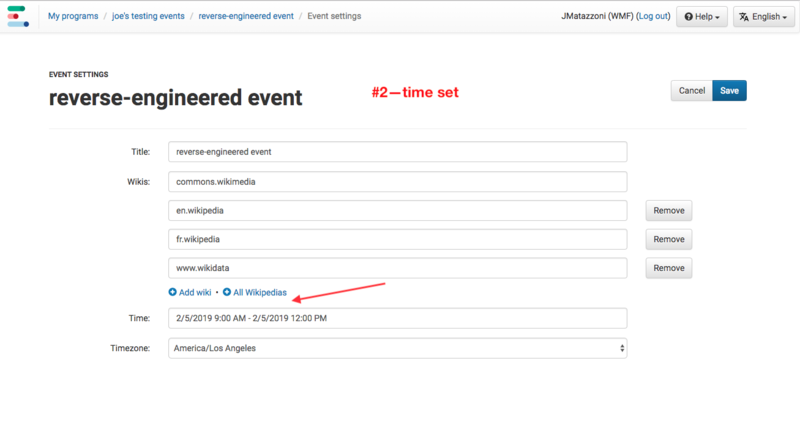 The timestamps you see on the Event Summary page are correct, it is just showing the wrong times when editing an event. That looks easier than we thought. The tests for this PR are now passing. Ready for re-review. Followed Joe's reproduction steps to make a new event and did not see the bug. I couldn't reproduce with preexisting events either. 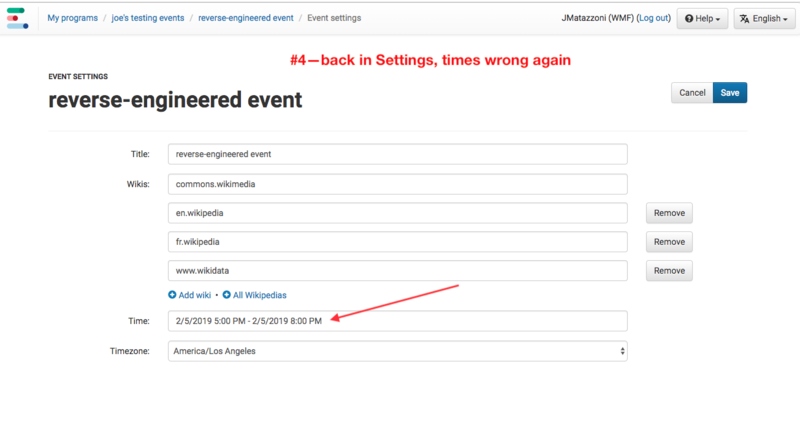 I also notice that Joe's event from the Description now shows the correct date in the date picker on the Settings page. I checked that I could change the date/time for an event with the date picker and that this was reflected in the event summary page and on subsequent visits to the Settings page. jmatazzoni moved this task from Product sign-off to Q3 2018-19 on the Community-Tech-Sprint board.